Today I walked to my local Starbucks (you read that right -- WALKED, in Los Angeles!) 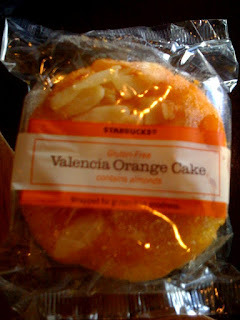 and was so happy to see that they had the Valencia Orange cake prominently displayed in their pastry case. Mind you the cakes are individually wrapped so there is no issue of cross-contamination with the other pastries on display; alongside the display cake was a sign with large print that read "Gluten-Free" and gave a description of the treat. Thanks to Vanessa for the iPhone pic! More importantly than how it is displayed, however, is how it tastes. This Valencia Orange treat does not disappoint. It's topped with almonds to give it a satisfying crunch as you bite into the moist, spongy center of the cake. The cake explodes with flavor and is sticky to the touch! I absolutely loved it, and am very happy to know that it is available to me at Starbucks nationwide. Unfortunately there is a downside: the nutritional information. This little cake packs 290 calories, 16 grams of fat, and about 42% of your daily value of Cholesterol (around 125 mgs). It also contains 32 grams of carbohydrates. So that's the bad news -- this isn't something I see myself snacking on frequently, but it's good to know that it is always available at my local Starbucks. Also of note: this tiny cake packs 9 grams of protein!